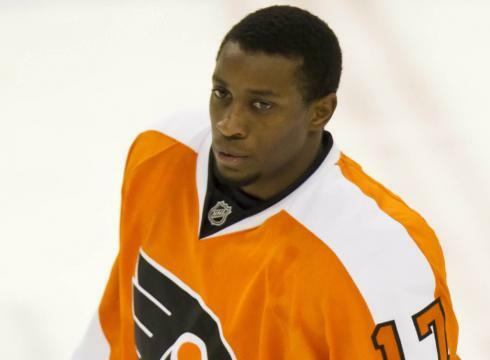 LONDON, Ontario (AP) -- Ontario police have charged a man for throwing a banana on the ice toward Philadelphia Flyers player Wayne Simmonds during an NHL preseason game. Police say 26-year-old Chris Moorhouse of London, Ontario, has been served a summons for engaging in a prohibited activity under the provincial trespassing act. If convicted, he faces a fine of up to $2,000. A banana was thrown from the stands Thursday night as Simmonds skated toward Detroit goalie Jordan Pearce at the John Labatt Center, about 120 miles from Simmonds' birthplace of Scarborough. Simmonds, who is black, issued a statement the next day, calling the situation "unfortunate." On Monday, Simmonds allegedly used an anti-gay slur against New York Rangers' agitator Sean Avery during an exhibition in Philadelphia. The NHL didn't punish Simmonds because the league said there wasn't conclusive evidence.